Topics: All Uzes Area, Arles, West-gard & Ganges, and Availability. Age: It went live on May 8th 2001, making it over 16 years, 11 months old. vacationrentalsfrance... For Sale: Houses in the South of France - France Vacation Rentals .. There are 2 Nameservers, ns2.net2.dedicatedns.com, and ns3.net2.dedicatedns.com. It is hosted by Alabanza Inc (Maryland, Baltimore,) using Apache/1 web server. 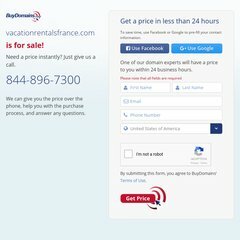 Vacationrentalsfrance.com's server IP number is 65.109.102.56. PING www. (65.109.102.56) 56(84) bytes of data. A time of 47.7 ms, is recorded in a ping test.